Who says gaming isn’t a social activity? If you enjoy tabletop games or video games and are looking to befriend people with similar interests, consider Eudemonia  on 2154 University Avenue. Eudemonia is a store dedicated to gaming of all types; they sell trading card games, board games, role-playing games and other merchandise. They also offer PCs installed with a constantly expanding library of games. The PCs are up-to-date with new releases  such as “Dead Island,” “Warhammer 40k: Space Marine” and “Deus Ex: Human Revolution.” However, Eudemonia is not simply a retail space but a source of community. The store hosts numerous events  such as pre-release and release parties for new TCG products. 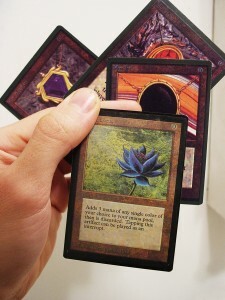 Every Tuesday is “Type Two Tuesday” where “Magic: the Gathering” players can meet up and play against each other. Every Thursday is “Board Game Night,” where participants play various strategy games and card games together. There are also occasionally LAN events such as the BATLL (Bay Area TeamLiquid  LAN) Starcraft II tournament. We noticed that on the events calendar [on the website], Eudemonia hosts a lot of pre-release parties. What do these events entail? Do you guys do tournaments? Yes. Almost all of our pre-release things are Magic related and we will do a sealed tournament — two, actually — one on Saturday and one on Sunday on the pre-release weekend. What’s exactly a sealed tournament? You are given six boosters, so a limited amount of [cards] and you make a deck from that. That’s very interesting because it feels like Eudemonia is not just a place where you buy new products but also has a real sense of community. Yeah, people do come here to hang out with their friends and, you know, meet with people and we have events and that’s a wide [range] of people who come here to spend time here. A lot of our store is actually made up of play space for them. Eudemonia has a lot of events from D&D workshops to people having their own RPG groups going on. Do you guys set up events or are people coming to you to set up these events? If it’s on the calendar, generally it’s an event [that] we will be hosting. We have some volunteer EMs (Event Managers) and the like, and we are, as a store, hosting that event. However, there are a lot of events here that we don’t host that we’re not in charge of. They are not necessarily on the calendar, but for RPGs we have games where people meet here to play their games here that have nothing to do with us. They just use our play space. That’s great then, Eudemonia is a place where pretty much anyone can set up their events. If you want a really big event, then you do have to come through us, because obviously, an event [already] set up will have priority so there has to be room for your event. So, a lot of the time, yes, we do approve them especially if it’s a larger one, but yeah, if it’s just your five or six people playing D&D, you’ll probably get by and you can just come in and sit down and play. If it’s a small group, there’s generally going to be space for you and it’s probably not going to be a problem. Okay, switching to the PC games, we noticed you guys install a lot of the latest games such as “Human Revolution” or “Space Marine”. But there are a lot of new releases always coming out so how do choose which games to install on the computers? Our computer technician actually has a lot do with that. He’s very involved in what games are coming out; he hears about them. Some of it’s just hype — if it’s an established new game that we know a ton of people will like, of course we’ll get it. You know ahead of time — same with movies — you know which ones are going to be big just by looking at [fan] communities. [Also], our computer tech is really into game development and the like and he will, if we have room on the computers, pick out games that are just good. What would you say would be the coolest aspect of being a part of Eudemonia? It can be anything. Hanging out with people. While at work, you get to be around the people you would be hanging out with anyway. There you have it. Go out and make some gaming friends! And play Deus Ex: Human Revolution . It’s awesome.